Considerable attention has been focused on women’s mental health in the perinatal period and the subsequent impacts on children. Comparatively, we know much less about maternal depression at later time points and the potential implications for child mental health. 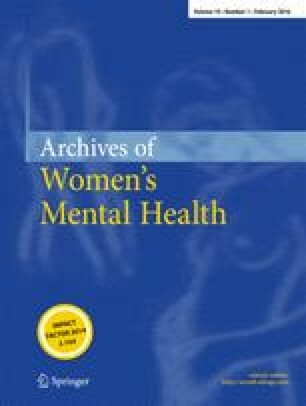 The objective of this paper was to explore the association between maternal depression and child emotional/behavioural difficulties at 4 years postpartum, taking into account earlier episodes of perinatal depression. The Maternal Health Study is a prospective cohort study of 1,507 nulliparous women. Maternal depressive symptoms were assessed using the Edinburgh Postnatal Depression Scale (EPDS) in early pregnancy and at 3, 6 and 12 months postpartum and again at 4 years postpartum. Maternal depressive symptoms at 4 years postpartum were associated with significantly increased odds of child emotional/behavioural difficulties (odds ratio (OR) = 3.46, 95 % confidence interval (CI) = 2.21–5.43). This remained significant after adjusting for earlier episodes of perinatal depression and socio-demographic characteristics (OR = 2.07, 95 % CI = 1.18–3.63). We also observed a robust association between child difficulties at age 4 and measures of socio-economic disadvantage. Our findings suggest a pressing need to rethink current paradigms of maternal health surveillance and extend mental health surveillance and support to at least 4 years postpartum. We are extremely grateful to all of the women taking part in the study, to the members of the Maternal Health Study Collaborative Group (Christine MacArthur, Kelsey Hegarty, Jane Gunn, Shaun Brennecke, Peter Wein and Jane Yelland) who contributed to the design of study instruments, to Creina Mitchell who assisted us in the early stage of planning recruitment methods and to the members of the Maternal Health Study research team who have contributed to data collection and coding (Sue Perlen, Ann Krastev, Ellie McDonald, Marion Tait, Liesje Brice, Maggie Flood, Kay Paton, Renee Paxton and Martine Spaull). This work was supported by grant nos. 199222, 433006 and 491205 from The National Health and Medical Research Council (NHMRC), a VicHealth Research Fellowship (SB), an Australian Research Council (ARC) Future Fellowship (SB), an NHMRC Career Development Fellowship (SB) and an NHMRC Early Career Fellowship no. 1037449 (FM) and a grant from the Medical Research and Technology in Victoria Fund (ANZ Trustees), and Murdoch Childrens Research Institute research is supported by the Victorian Government’s Operational Infrastructure Program. The funding organisations had no involvement in the conduct of the study, and the authors are independent of the funding sources. All authors had access to the study data and were responsible for the decision to submit the paper for publication. All authors have significantly contributed to this article and approved the final version of the manuscript. HW was involved in data collection, conducted literature searches, completed data analyses and interpretation and co-wrote the paper. SB was responsible for the study concept and design, data analysis and interpretation and co-wrote the paper. DG was involved in data collection, analysis and interpretation of the data and critical revisions of the manuscript. FM assisted with data analysis and interpretation and critical revision of the manuscript. RG assisted with data analysis and interpretation and critical revisions of the manuscript. The study was approved by the relevant ethics committees in all participating hospitals and the ethics committee of La Trobe University (FHEC/HEC number 05/86; 27 April 2002). Written informed consent was obtained from all participants.